My husband and I celebrated the sale of our North Carolina home with a prix fixe meal at this modern, French-inflected New American restaurant on Hayward’s downtown stretch. Using an Amazon Local deal, we dined on three courses each for only $40 including a glass of champagne. 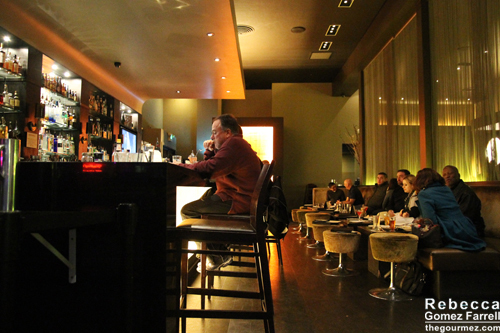 It was the second time I’d been to Bijou, and I love their bold design scheme of golds and greens with a luxurious dividing screen between lounge and dining room. It might seem contrary to the ambience, but both Sunday nights I’ve been have been popular ones for watching football in the lounge. 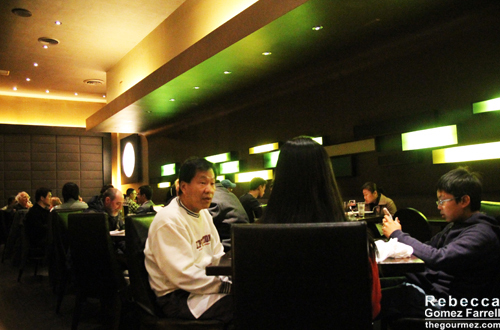 I’ve enjoyed that contrast of upscale dining with regular old sports-fan enthusiasm. On our previous trip, I also enjoyed the creative cocktail list and a delicious cream of cauliflower soup. 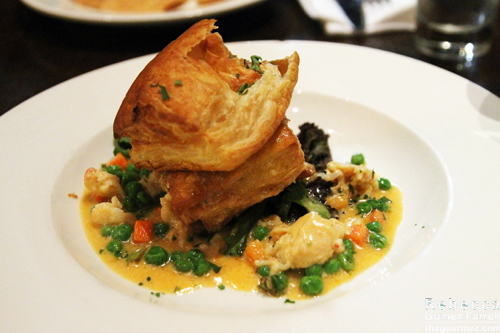 For this dinner, the best course ended up being my first one, a puff pastry served with lobster, carrots, and peas in a Pernod sauce. The puff pastry was almost overbrowned, which is the perfect time to serve it in my opinion. The delicate sauce showed off the succulent lobster bites, and the peas and carrots hearkened back to a traditional pot pie. My husband’s scallop ceviche exhibited a skillful union of flavors. Freshly fried chips would have been more impressive, but the balanced citrus made for a great ceviche. 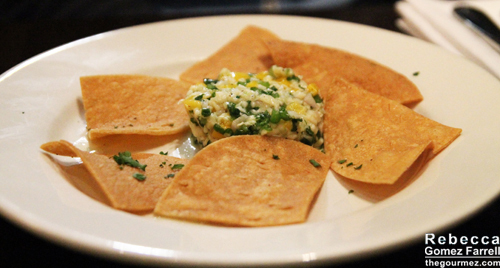 The corn’s sweetness and soft crunch was an especially nice touch. The main courses were both good, though they lacked finesse. 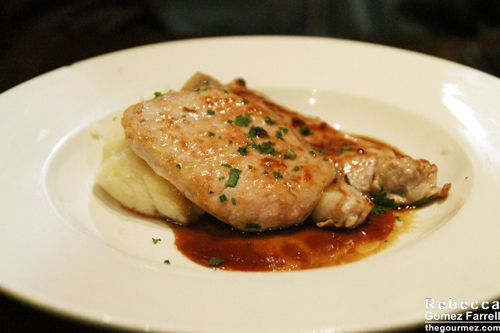 My husband had the roasted pork loin with garlic mashed potatoes in a champagne-grape gastrique. It tasted fine, but I think both of us felt more attention to presentation would have made it more appealing. 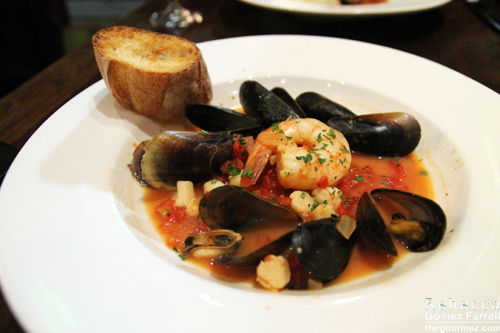 My seafood bouillabaisse with a tiger prawn, mussels, bay scallops, and cod in a tomato sauce started out delicious. I was especially intrigued by the springy texture of the hidden cod pieces, and the sauce made for a bright complement to the seafood…until I dipped my baguette in it as one tends to do with mussel dishes. Soaked into the bread, the pepperiness of the sauce became overwhelming. As I ate more, a layer of pepper was exposed on the bottom of the bowl. If that pepper was dialed back, the dish would have been great, but too much spice ended up being my lingering impression. Dessert was an adequate sweet end to the meal. 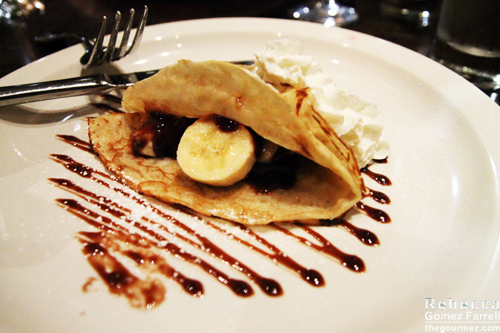 It’s hard to go wrong with banana and Nutella crepes with a chantilly sauce. You don’t want to know how many times I posed that picture so you could see the filling. Those ingredients can be considered classic crepe fillings at this point, and there’s a reason for it—they go wonderfully together. The crepe was a tad undercooked, but I’m not a crepe purist, so that was no problem for me. Service was fine throughout the meal. At normal cost, I would have considered this experience not quite up to snuff for a prix fixe offering, but at a discounted rate, I can’t complain. 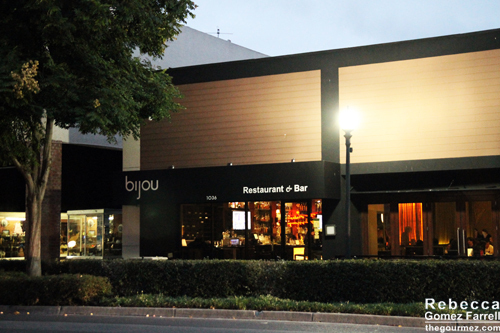 I like Bijou as a dressier alternative to the other downtown Hayward spots, and I’ll be back. However, I think I’ll turn my eye, or taste buds rather, toward their small plates and pizza offerings.